Posted Oct. 15, 2015, 7:42 p.m. It's been a few months. I've mostly been working on ScreenPlay, though I've found some time to work a little on the Corvallis Game Devs website and help organize some workshops for that, too. ScreenPlay is starting to look promising, and now it does cutscenes! You can code them entirely in ScreenPlay annotation without touching C# at all. Just drop some images in your project's cutscene images folder, and you're off! So, griefing. I had the opportunity to put my game in front of some kids a week ago. They left the session liking the game and wanting to play more of it, but throughout the play session it became clear that these kids hated each other. It gave me weird flashbacks to my childhood as two of the older boys said "This would be really cool if it were me, and you, and... (some of his other friends who weren't playing the game just now), and not these two (pointing to the two little girls playing with them)." Good to see that social dynamics of middle schoolers haven't changed much in 15 years. The tension was real, and one of the girls retaliated against that jab by ramming on the A button to progress the dialogue faster than anyone could read. Aside: Right now, ScreenPlay stories have two modes of dialogue progression. The first mode allows anyone to progress the dialogue unless a line is flagged as particularly important, in which case all players have to press A to continue. The second mode requires all players to press A to progress any line - I was calling it "forced cooperation mode." After a little while, the other kids gave up trying to read any of the dialogue and commented "This is stupid" out of frustration. We restarted the game with the same group in "forced cooperation mode." The older boy who made the snarky comment earlier then punished the girl who was progressing the dialogue too fast by reading each line out loud in super slow motion before pressing A (which was required to progress the story). This had much the same effect - the kids would sigh and look around waiting for the next line to come up as this guy casually talked to his friends and stalled in any other way he could. Eventually everyone just left. 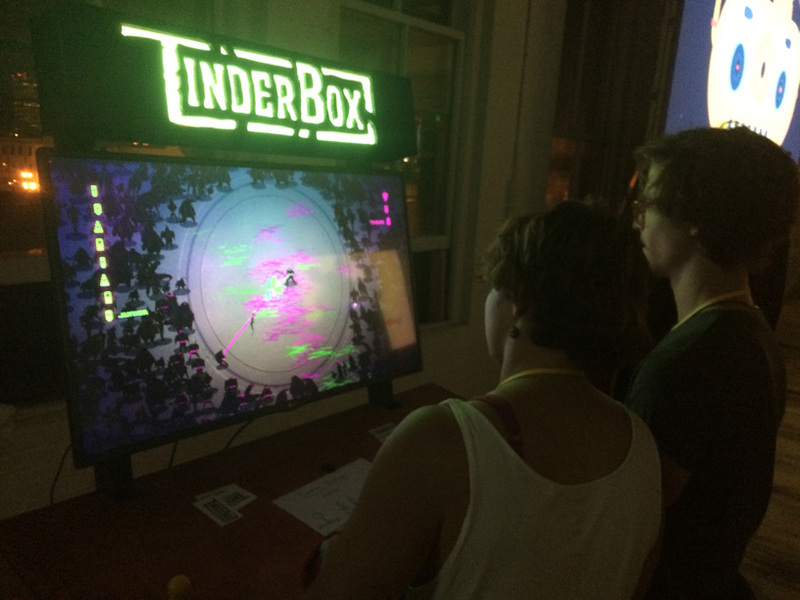 While I was at Indie Game Con down in Eugene, I saw this awesome arcade cabinet people in Portland had put together called the Tinder Box. It had many of the multiplayer games on it that were being shown at the expo, and people could just come in and play in this quiet little room off to the side of the expo floor. The thought occurred to me - what if ScreenPlay were on an arcade cabinet? The idea of people playing a visual novel in an arcade is so stupid that I have to make it happen. With a joystick and 4 buttons per player, it would be perfect for the input scheme I already have. I talked to the guys in charge of the Tinder Box, and am totally planning to get in touch with them once this thing is ready to go! I'm already thinking about what to put on it... Longer games would be okay so long as the save system had some sort of password protection, so that's on the to-do list. But for short sessions, you could have 4-player Werewolf, a quiz game like You Don't Know Jack, or even something like Say Anything where the quiz questions are about what someone else thinks (Player 1 secretly answers a question, and the others guess what they think Player 1 said). Outside of ScreenPlay, workshops! We're doing a sort of Game Dev Boot Camp for new developers at OSU. We had a really positive first meeting with a ton of people getting to meet each other and talk about what kind of games they're into. Now we're doing a series of workshops on art, programming, and design to get their hands dirty trying out various things. And after that, we'd like to get people working on short projects together that take like 3 months. Once people start cranking out games we'll be able to promote them on our site and shout from the rooftops "Look! Games!" So that's the plan so far. Really happy to see this community starting to form, and people are enjoying the workshops so far. Fingers crossed for more fledgeling devs!